Ok cheers for confirming James!! Just as the storm crossed the highway on radar it appeared to have weakened so I was guessing large hail wouldn't have fallen then but obviously it did. If that was the case I wonder how big the hail was when the storm was at it's most intense!!! Probably around Tulkan?? If that road was not dirt I would have driven straight into it as I took the Tulkan road. I have finally finished the videos of the chases. Please excuse the overuse of the word 'big' and 'intense' in the first video, as well as the brief period of swearing in the core of the storm. I'd edit it out if I had the software!! Plus, I need to watch my language more lol. 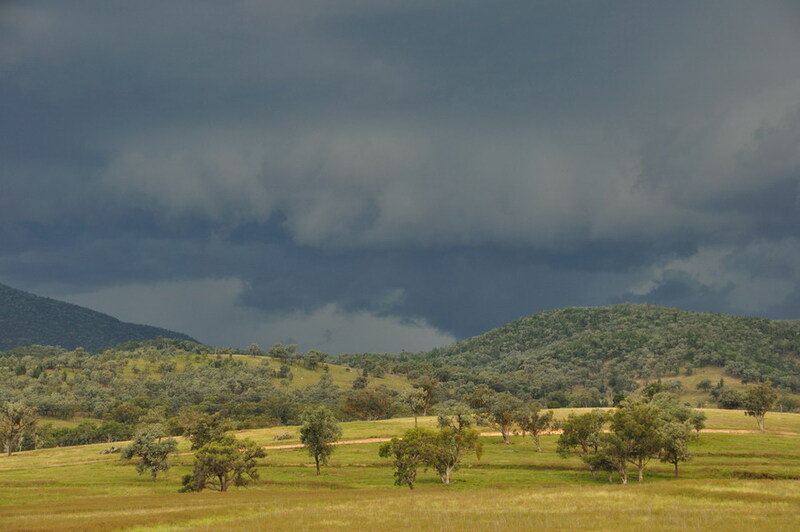 The target for this chase day was the Coonabarabran Gunnedah region with a northward progression to the Narrabri area expected by evening. Model output indicated more favourable shear for the Mudgee region but it was not really feasible to get that far south in time. With Rodney Wallbridge at the wheel of the Rav4, Jason Paterson shotgun and me in the back we departed Casino about 7am. The sky was encouraging the whole way and it was especially nice not to be battling with cloudy skies or showers. 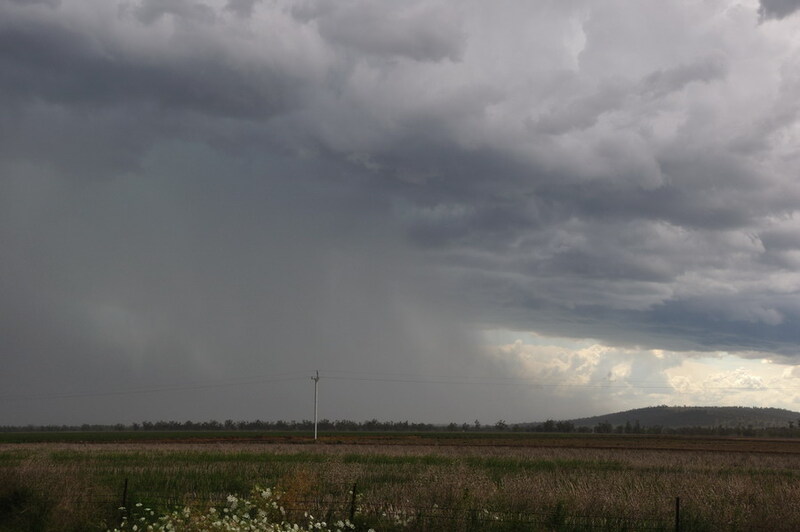 The first storms fired from late morning in the Nandewar Ranges east of Narrabri. 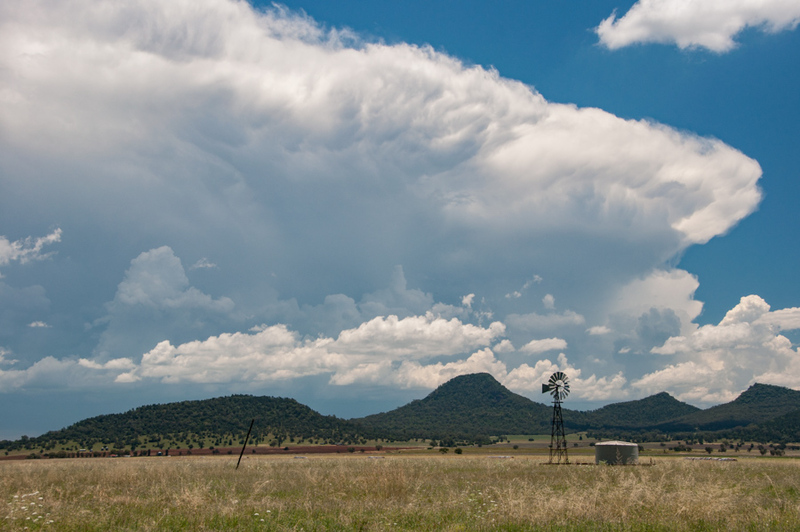 A strong storm developed over Coonabarabran. We were just west of Mullaley when Jimmy phoned to report 2-3cm hail. This storm appeared to be tracking NE so we headed NW to Goolhi. The northern end of the cell weakened but new updrafts formed on the outflow. 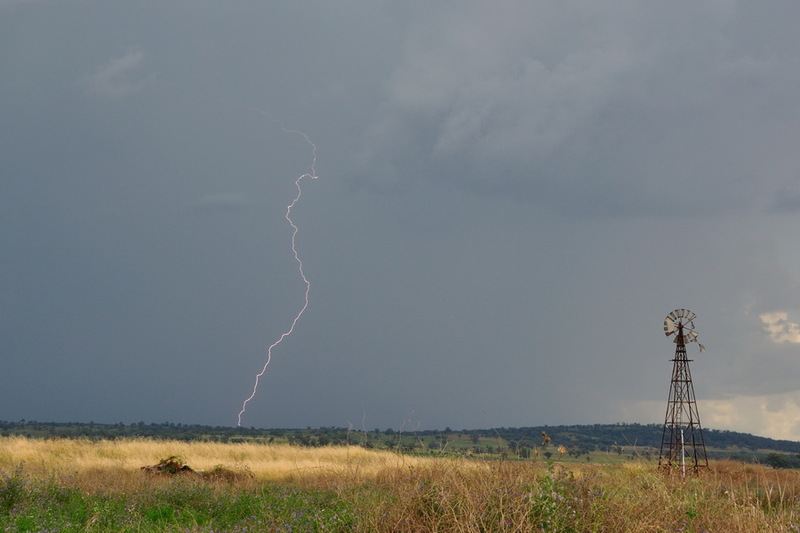 Base features were fairly limited but the CG lightning was quite frequent. 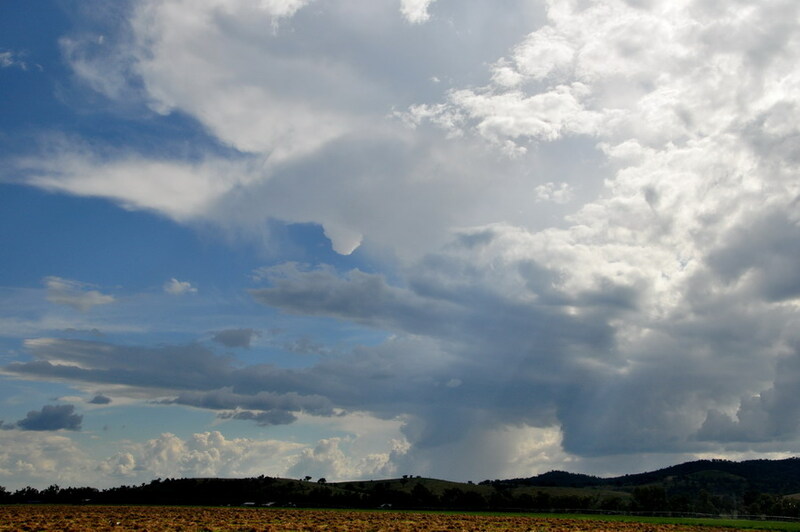 Fresh updrafts formed overhead before we made a move NE towards Boggabri. It was a bit late as an intense microburst enveloped us. 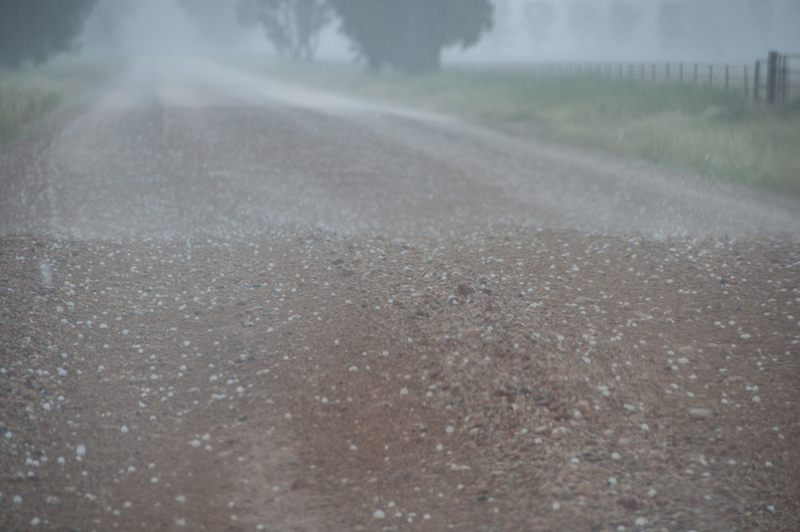 Wild winds, torrential rain and hail to about 3cm smashed all around. The Rav did cop quite a few dents! 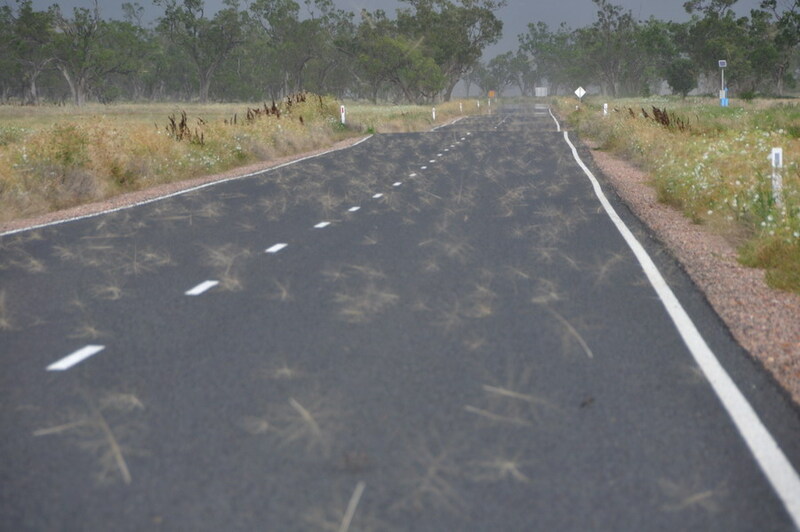 The outflow pushing north was quite spectacular, lifting dust ahead of it, and sending tumbleweed things zooming down the road. It was near Baan Baa before the outflow eased. 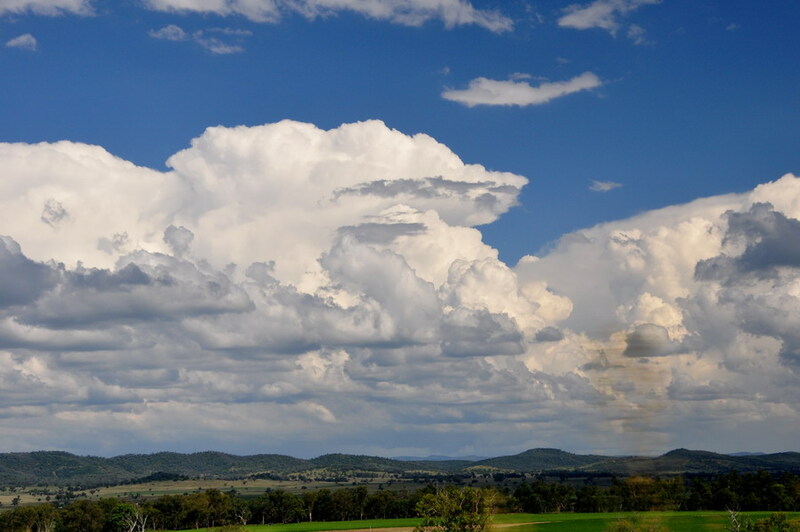 New storms exploded along the Nandewar Ranges (Mount Kaputar). 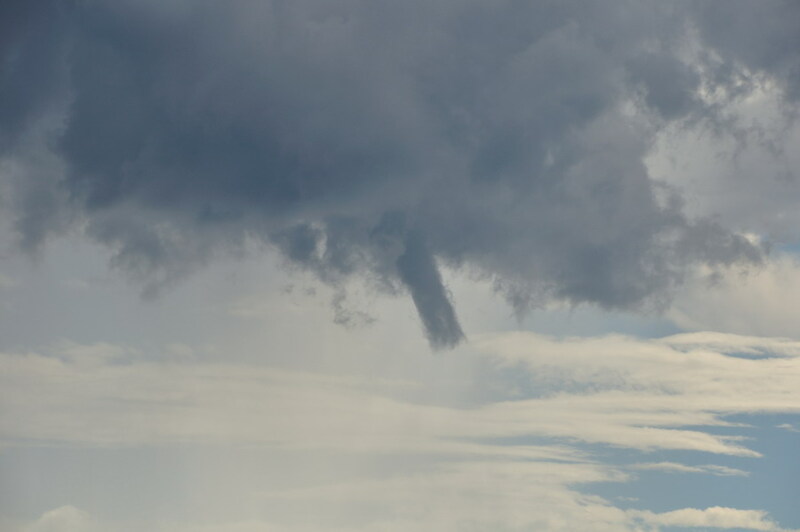 Locally a small updraft from the remnants of the storm we had been blasted by managed to produce a funnel which lasted at least 10 minutes. We made our way to Narrabri while there was a lull in local activity and to organise accommodation. 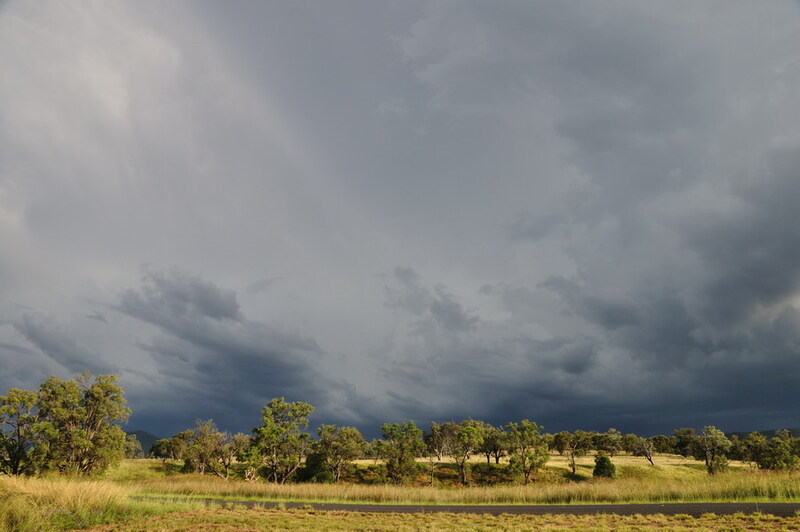 We then headed out to the Wee Waa area as storms to the SW and W spread in. Around 7pm what appeared to be a line of high based congestus formed right overhead. The number of close CGs this thing produced was astonishing. Of course rain from anvils just had to cause grief. 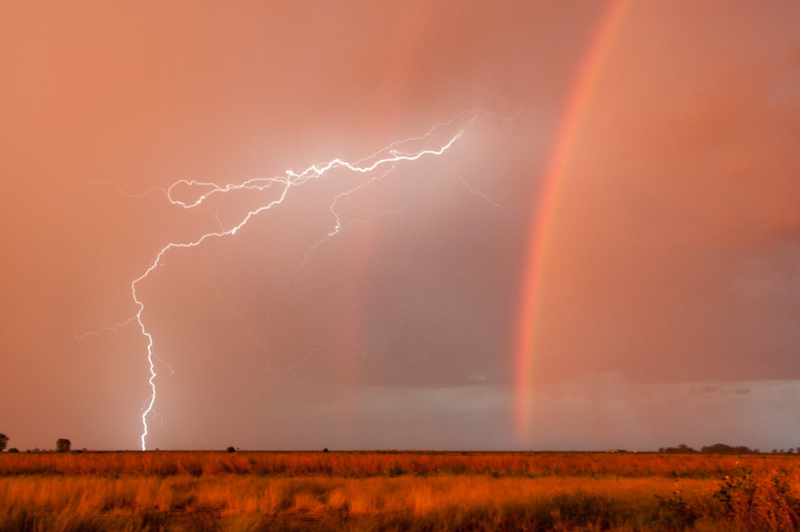 The rain got heavier, the sunset colours made their appearance and the lightning got closer and better! 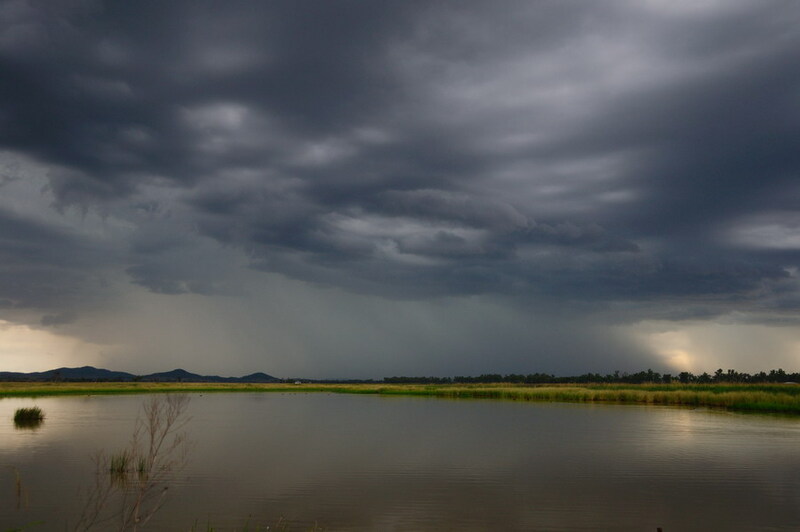 By nightfall the rain was still persisting and the only lightning what was worthy was on the ranges east of Narrabri - and we couldn't quite find a location in the gin that faced the right way with shelter. So we called it quits. The target for today was Ashford, Bonshaw, Texas. All the storm ingredients were less favourable than Monday but that was no surprise. The road network is quite limited in this region - especially towards the east and south-east. 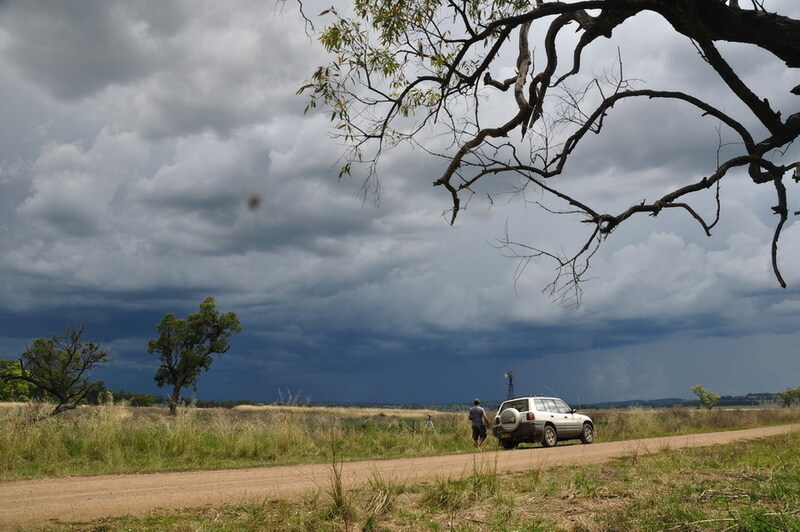 Before any storms developed we took the time to explore the Kwiambal National Park about 25ks northwest of Ashford. A beautiful location where the Macintyre and Severn Rivers meet in gorge country - and there is a cave (with bats) you can venture into so long as you have torches facebook pics. Near Bonshaw the Dumaresq River (QLD/NSW border at this point) was in flood and managed to rise another 20cm during the course of the afternoon. 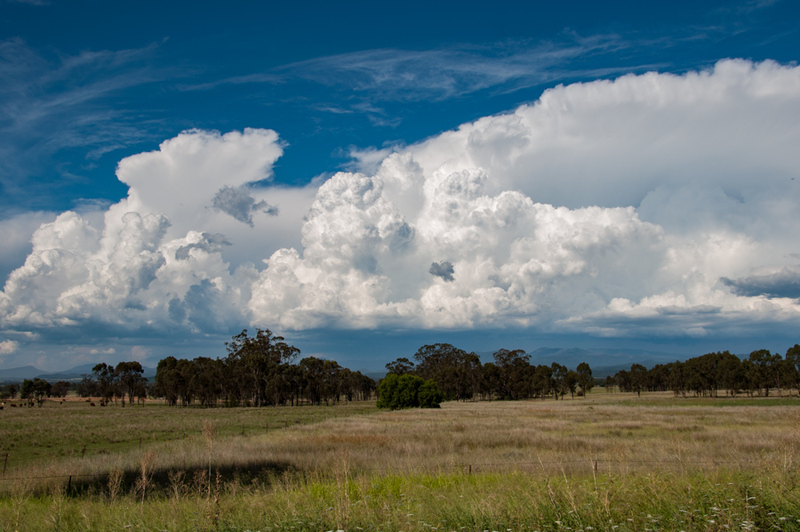 This must have been from heavy thunderstorm rainfall Tenterfield to Warwick areas Sunday evening. Thunderstorms took a while to get going. Early cells seemed moisture starved and the shear really was terrible. 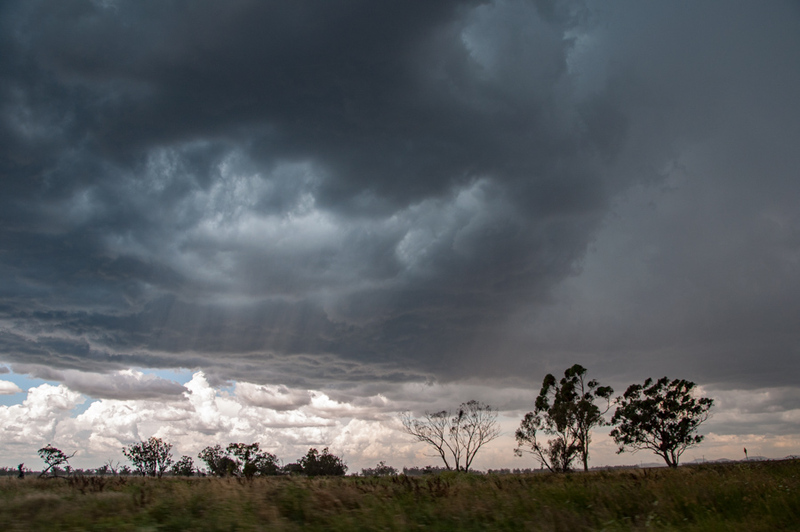 Stronger cells took off along the Northern Tablelands around Glen Innes and slowly spread NNW towards our location (south of Bonshaw, right near the southern-most dip in the state border). 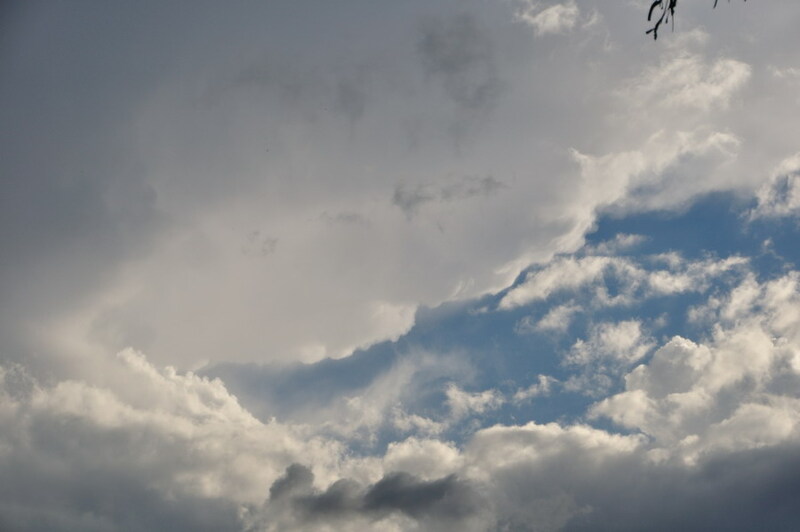 The afternoon light produced some great cloudscapes. 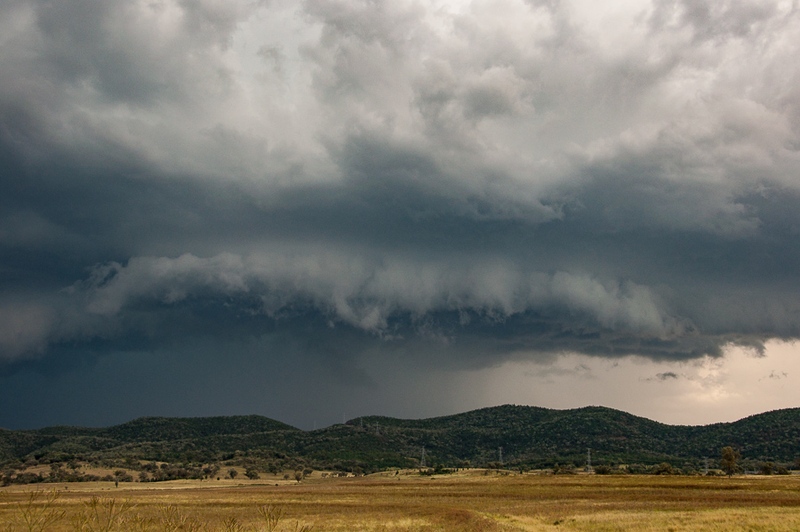 We ended up being in the right location for one of the better storms of the day. 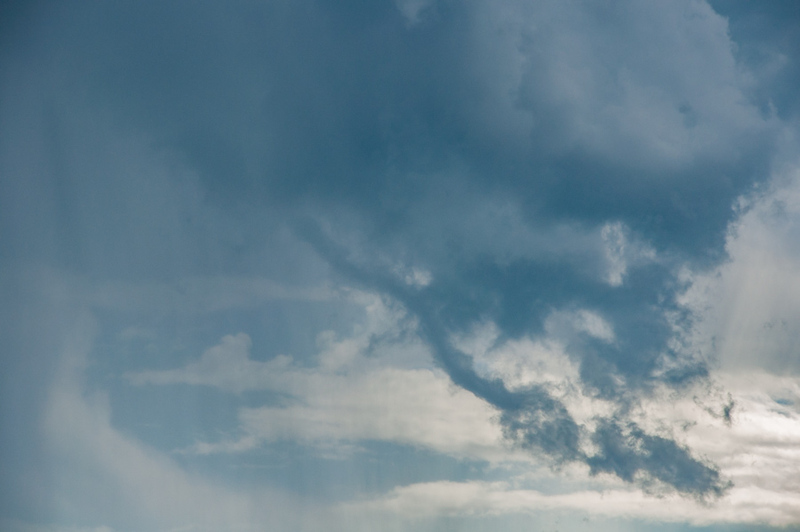 Between 5.30 and 6.30pm a cell punched higher and managed to produce some severe looking features. 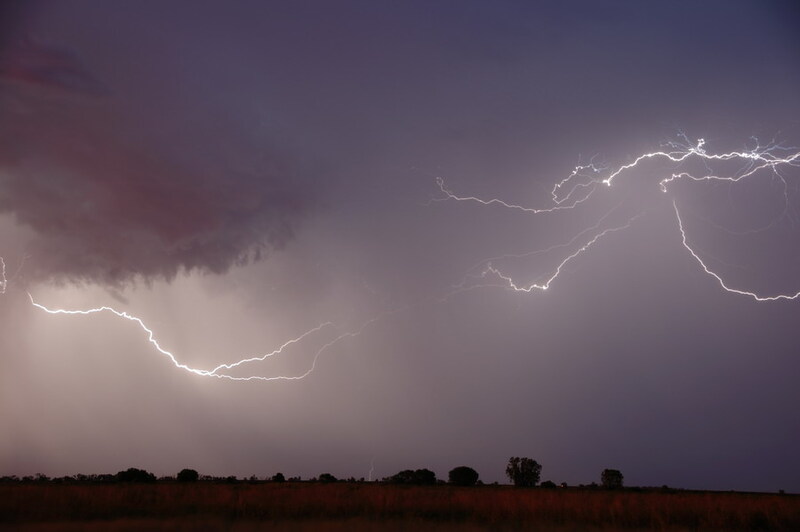 The thunder was frequent but lightning bolts all but invisible. 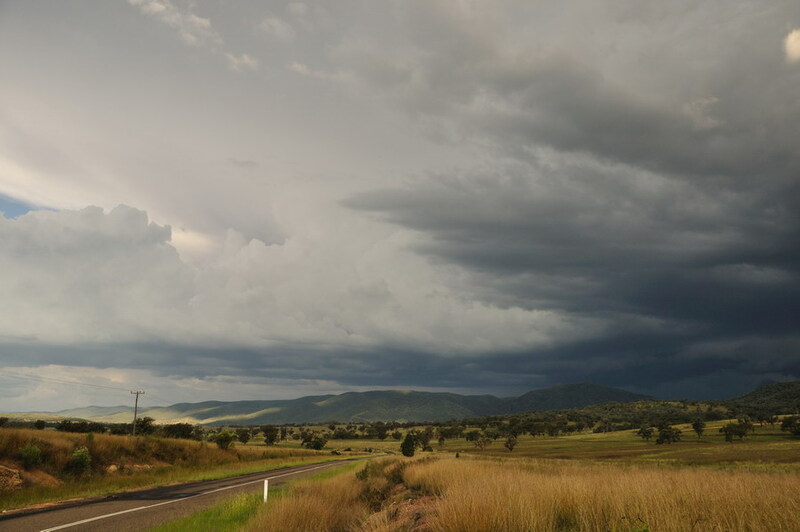 A lovely high contrast gust front cloud spread across the mountains and into the Dumaresq Valley. We could hear the roar of the wind. There was probably hail nearby but no way to know. Outflow pushed ahead and started to kick up new cells west of our location. We moved north to a nice spot just east of Bonshaw. However the lightning would not co-operate. There was plenty of it but must have all been updraft and anvil lightning. 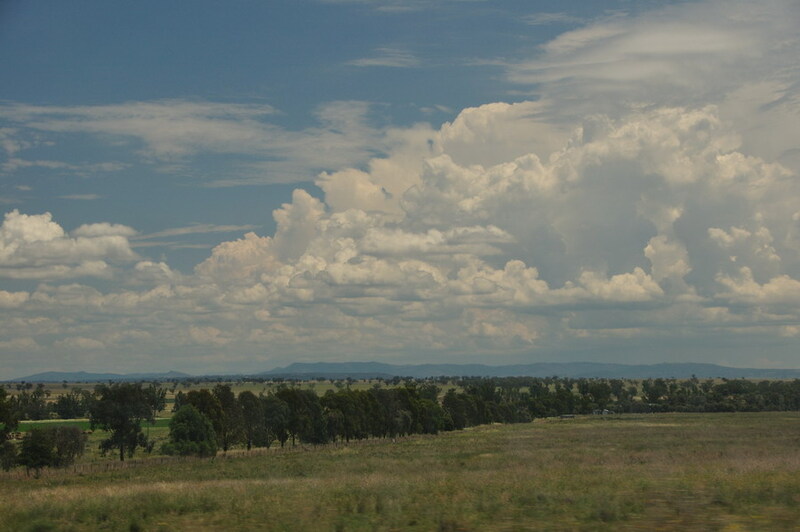 Is this 10 - 15km north, south, east or west generally from Dunedoo? Nice to see very large hail in the area! 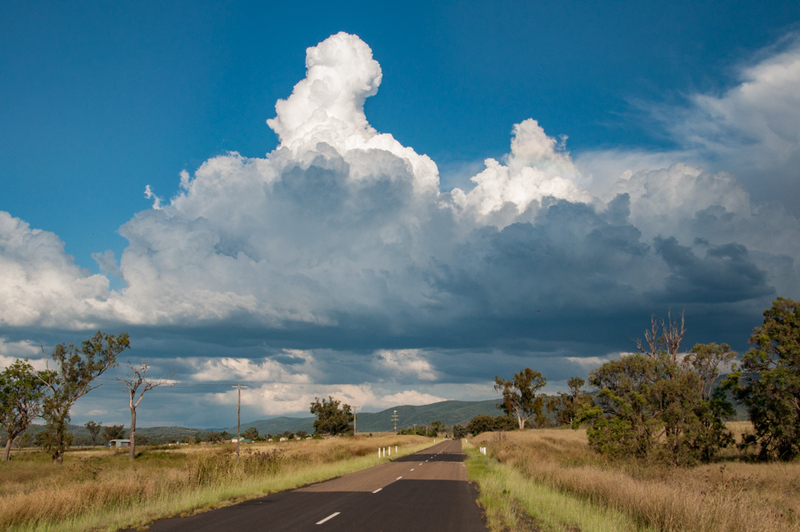 Yeah that was on the road that went west of Dunedoo. Maybe in hindsight not as far as 15km, but certainly in the 5-10km vicinity out west from Dunedoo, which would still suggest the other cell producing the big hail according to radar. But I'll trust James on this one, seeing as he did corepunch the other cell! Wow! Some amazing photos there MB, also a great video composite Pato! Nice job by all involved. Looks like you guys had an interesting couple of days chasing out on the NW slopes and plains! Seeing this is getting me excited for Springs arrival this year. It would be so nice to see something slightly more impressive than last season's effort. I didn't even really get anything worth noting out this way structure-wise. 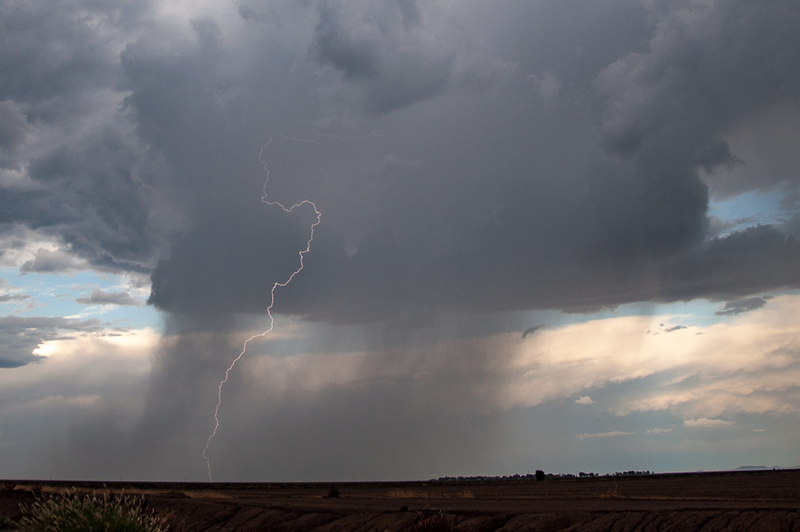 Only about two good evenings in total with decent lightning. I'll put the pictures and info up when I can. We have the Opal Expo on here this weekend so I should be able to get some posting done around Monday. Hope everyone here has been well!